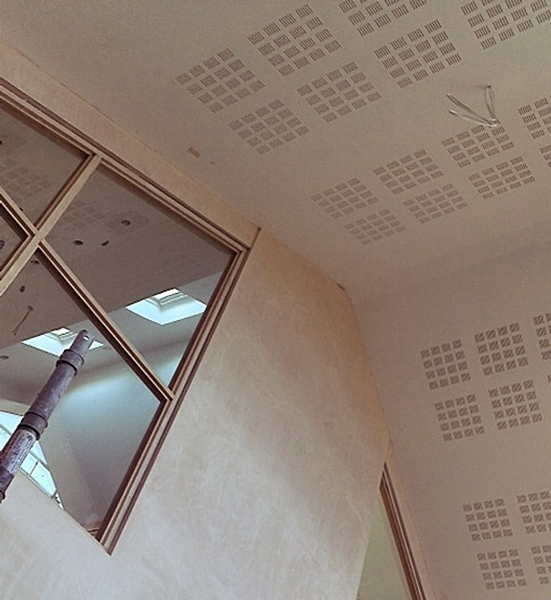 MF Ceiling’s are used in all types of buildings to provide a suspended galvanised framework onto which plasterboard can be fixed to receive a skim or tape and joint finish to achieve a seamless finish. The suspended nature of the m/f enables services and structural members to be concealed in the void created. To achieve access to items of plant in the void a large range of access panels in available in both standard and bespoke sizes with various combinations of door materials including fire rated panels in required. To upgrade the performance of an m/f ceiling the lining board can be changed to other specialist board to achieve enhanced fire and sound properties with single layer and double layer installations along with appropriate insulation to the rear to upgrade the thermal properties. The end result of a m/f installation achieves a seamless appearance with no visible metal framing. A range of galvanised and aluminium feature beads is readily available to enhance the appearance at changes in level or abutment. MF Ceilings have the added versatility in that they can they can be cut to fit, making them perfect for the more bespoke projects. Added to this, they can be finished using many decorative techniques. O’Brien Interior’s experience with different types of ceiling installations makes them the perfect contractor to advise you on the best option for your project.